It’s been ages since I’ve done anything here. I’ve been busy with other things. That’s no excuse, though, is it? As of this post, I’ve migrated this site to the same server where I host everything else of mine, which will let me save a little money. Going to install a project management plugin and start recording progress here. Evaluating LOVE as a new engine to migrate my existing work to and move forward, as I’ve reached the limits of my frustration with Pygame. I’m not promising a whole lot right now. But I plan to take a step back from my other blog in a couple months in order to focus more on this. I may bring on some more social engagement features and things like that. Honestly, I don’t care too much about those, as long as people are able to find this blog easily enough. In any case, look forward to some more news over the next few months. It’s been a long time since my last update. Rest assured, I’m not dead, I’ve just been busy with that other game we all love known as “real life.” That said, it’s not that I’ve gotten nothing done on SagaSim. I’ve done very little programming but I’ve been brainstorming other aspects. In particular, I’ve developed the species system in more detail, specifically dealing with traits. In the previous entry, I laid out how the DNA system works. Now, it’s time to define just what all the various DNA-defined traits mean in terms of simulation behavior. Mobility — Animals can move, plants can’t. This literally just affects whether a species can move from one location to another as part of normal simulation activity. Immobile species can only “move” by reproducing into an adjacent tile. Sustenance — Plants need sunlight to live. Animals must eat to live. Threat — A value indicating how severe a threat this species poses to others. Think of this like an “attack” statistic from role-playing games. Vulnerability — Sort of the inverse of Threat: how easily this species can be harmed by others. This is akin to a “defense” statistic from role-playing games. Size — Determined by various traits. Size values are exponential: a size of 2 is ten times size 1, size 3 is ten times size 2, etc. This is useful when determining which animals can eat which, as generally larger animals eat smaller ones. Resources — Some species produce resources usable by civilizations, such as fabric (think silk.) I will probably come up with more of these, e.g. leather, fur, etc. Migration — Some species migrate, which means they can relocate from one tile to another based on availability of food resources. Now, any animal species will migrate in an effort to find food, if food becomes genuinely scarce where they are, but a migratory species will migrate either randomly or just if there is a more optimal source/quantity of food nearby. Herding — Animal species can be solitary, or they can operate in packs, or colonies/hives. Animals that operate in herds receive a vulnerability bonus based on their local population. Herding behavior also determines the maximum population for this species on a given tile. There are some other attributes I’m still roughing out. The next step will be to create the basic species simulation system that simulates populations on a given tile. That one is going to require quite a bit of programming and I might write a blog post about it next, as I work out the particulars. Most of the brainstorming I’ve done over the past several months was related to the civilization system, so admittedly I’ve neglected the species system in that time, hence the rather sparse update this time around. I’m hoping to get another update done (with actual development progress!) in the next week or two. This may not be a super exciting entry, as I will be carving up SagaSim into a bunch of pieces to determine what I need to tackle individually. This list will probably change over time, and once I settle on a good project management system, I’ll turn all of them into tasks/projects in it. Gotta have something to motivate and organize here. With my blather out of the way, on to the actual breakdown. I envision SagaSim as being made up of multiple high-level modules, and then submodules. There are two overarching components to the entire project: the world generation, from the terrain all the way down to individual characters; and the simulation, which controls the interactions of everything that’s been generated. Water is obviously an important chemical for any world to sustain life as we know it. It’s why so much of SagaSim’s world generation revolves around the distribution of water. Up to this point, we have oceans and inland lakes, but we’ve not discussed rivers, nor assignment of biomes. Both of these are influenced by climate, and biomes are also influenced by rivers. I will discuss how each is generated. Let’s start by generating another new world, because that’s just so much fun. (You’ve probably gotten the impression by now that the world generation process is fairly disposable and I can make new ones quickly and easily. You’d be right!) Let’s start with the terrain and climate maps, since those will determine the behavior of the river generator. Terrain to be used for river demo. Climate map to be used for river demo. Terrain map with rivers overlaid. 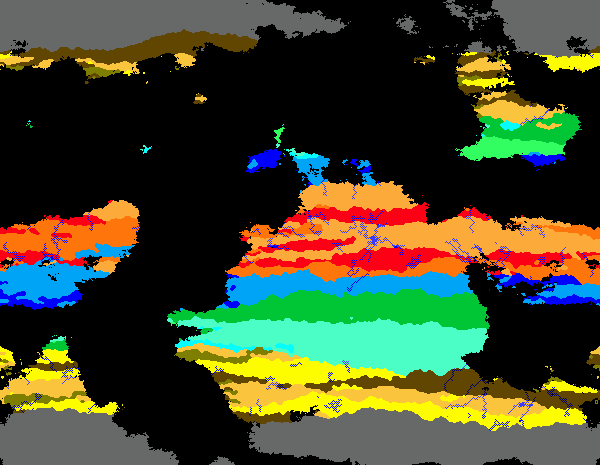 Climate map with rivers overlaid. You can see how they flow down from high ground to low ground, either working toward the coast or toward the lowest point they can reach. Sometimes, multiple rivers will meet at the same low point and join together. Sometimes, a river may flow around a low level long enough to create a lake. So, how are they actually generated? Given our existing map dimensions (600×465), each river will run for up to 1395 pixels. That may sound like a lot, but bear in mind that once a river reaches the ocean, it has nowhere else to go, and once it reaches its lowest point, it will simply pool around that. Rivers can never climb uphill. The length limiter is admittedly arbitrary. One could generate much longer rivers by making that number larger. I’ve found that 0.001 makes them too short, but 0.005 produces lengthy yet not overwhelming rivers. This process is run to generate a set number of rivers. I use 100 as a default, but it’s a user-defined option so you can have as many or as few as you like. Each biome type is associated with one or more climate types and one or more terrain types. 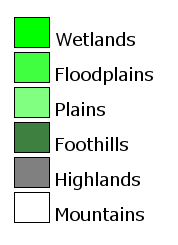 For a given land pixel, the possible biome types are determined based on the terrain, climate, and whether any adjacent pixels are river or ocean pixels. In particular, riparian biomes must be adjacent to/on a river, and coastal forest biomes must be adjacent to an ocean. Once we have the list of possible biomes for this pixel, the logic is then very much like climate logic: surrounding pixels are examined for their biomes, and the biome generator will either pick one of those or (less likely) pick a random one from the possible biomes for this pixel. 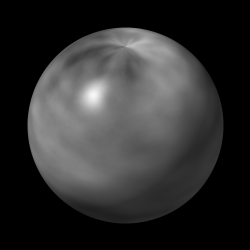 This produces a “banding” effect similar to the climate generator. Like the climate generator, the biome generator currently doesn’t wrap seamlessly at the left and right edges of the map. 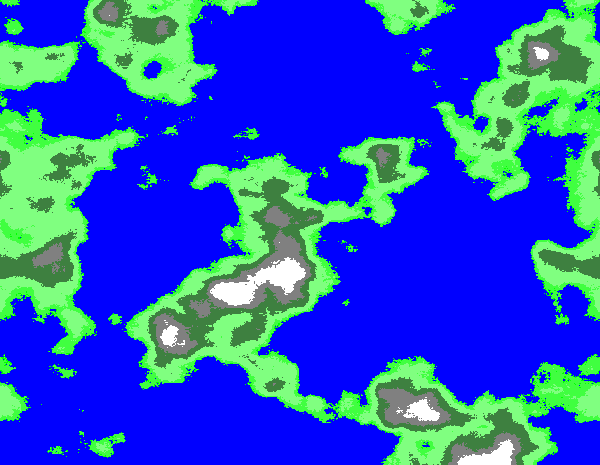 Unlike the climate generator, we only make a single pass to generate the biomes, rather than several. These issues will likely be corrected/modified at some point in the future, but they are sufficient for now. Biome map with rivers overlaid. These classifications are all based on the World Wildlife Federation’s terrestrial biome system. No sense reinventing the wheel here, right? Believe it or not, at this point we’ve taken care of the basics of world generation. We have a planet with a terrain map, we’ve laid out its climate, waterways, and biomes, and now we’re ready to start populating it with forms of life: plants and animals! Those will be discussed next time. Note: In the course of working on this entry, I realized there was a bug in the river generator, which I’ve since fixed, though the images were generated with the buggy version. Let them serve as a lesson that there are always improvements to be made. Future blog entries will use the corrected river generation algorithm. 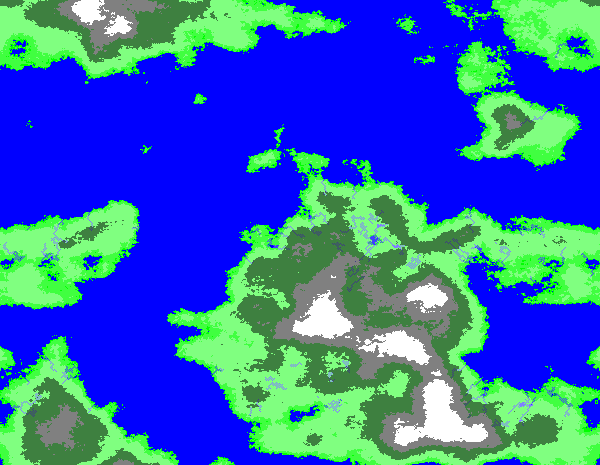 With terrain generation done, along with the segregation of land and water, we can move on to more complex matters. Here’s where things become more subjective and creative. What terrain types are necessary? How do we handle climate? I decided to start with basic terrain types contingent on elevation. At the lowest level is water, which isn’t really a “terrain,” but it’s there for the sake of making the terrain map look sensible. Who wants to look at a black ocean, seriously? Yes, it really is that simple a decision. Example of a colored terrain map. As you can see, the whole gamut of terrains is covered. The terrain definitions, like many features of SagaSim, are parameterized and customizable. It will therefore be possible for people to tweak the terrain definitions and do fairly wacky things, if they’re so inclined. Next up is climate! In SagaSim, climate is a function of two things: elevation and latitude. Rather than completely reinvent the wheel here, I decided to make use of the Köppen climate classification system. SagaSim’s version is rather simplified, though I’ve left the door open to make it more realistic in the future. 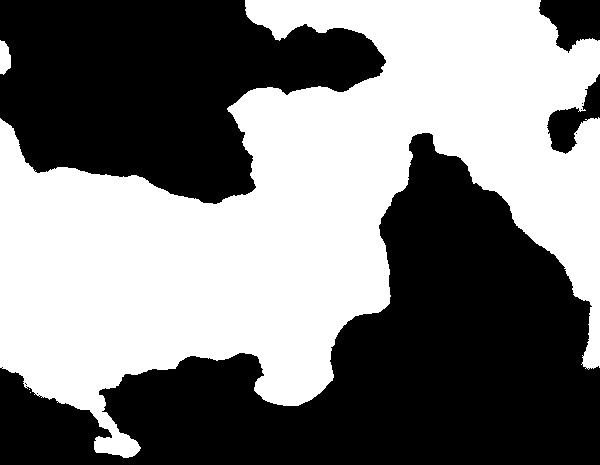 For now, the idea is to just have SagaSim generate climate zones for the world map so the later generation steps can be carried out. Each climate has four parameters: its minimum base latitude, its maximum base latitude, whether it’s considered a rainy climate (a simple true/false value), and the color to use for it on the map (same colors as those in the Wikipedia article.) I say the latitudes are “base” latitudes because the climate generation algorithm doesn’t have to precisely respect them. Instead, there is a fair amount of variation allowed. This will normally generate a very small number, roughly 1% on most maps. Then a random decimal is chosen. If it falls below the probability threshold, then we will pick a new climate from the available types, rather than an adjacent one. The “banding” effect is a consequence of the latitude restrictions and the probability checks. This allows for substantial climate variation without having climate zones go too far out of their assigned latitudinal ranges. 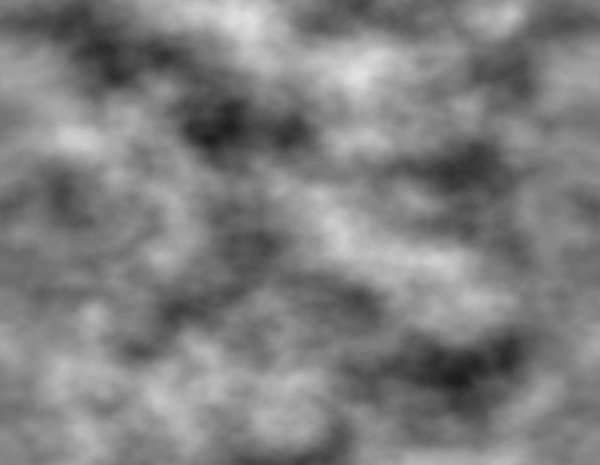 One shortcoming of the current climate generator is that, unlike the perlin noise generator, it does not produce a seamless map. If you were to wrap the above image around a sphere, it would be discontinuous at the left and right edges of the map–the climate zones wouldn’t line up. I intend to fix that, though I’ve not yet gotten around to it. It might seem like we haven’t done much so far, but it’s all a means to an end. Next time, I’ll get into how rivers and biomes are generated. They’re more complicated than (and dependent on) terrain and climate, so they may get split into two articles. One of my goals for this blog is to have almost everything written in such a way that non-programmers can understand it. If I make especially technical posts, I will probably put them under their own category and not have them be essential reading in order to comprehend the project’s components or the project as a whole. 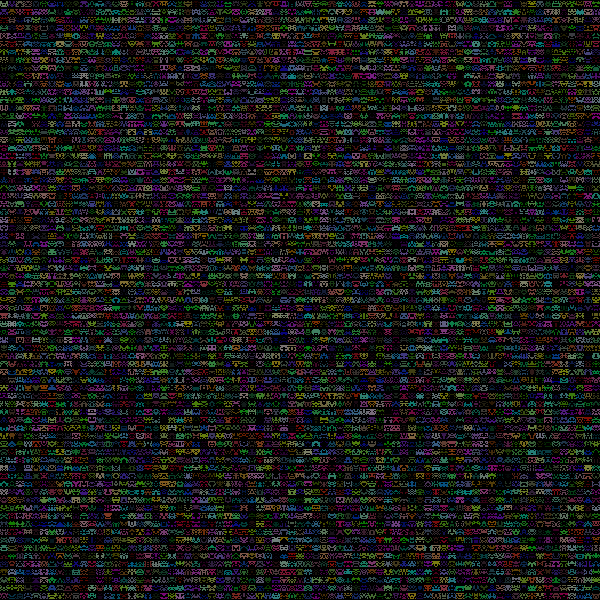 A sample of noise generated from within GIMP. Large-scale structures that give definition to our generated terrain. 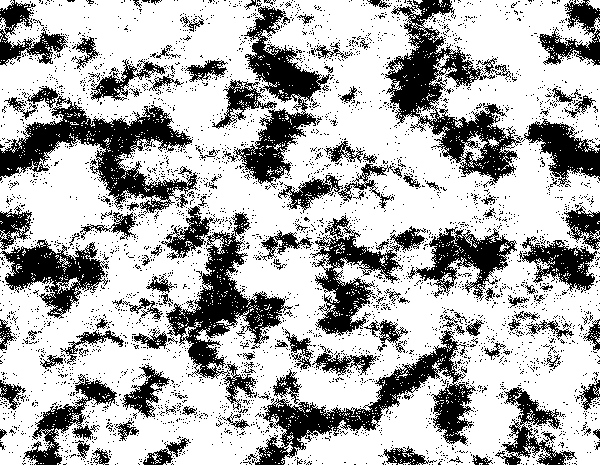 Seemingly random variations that allow for easy creation of virtually endless unique terrains. Based on mathematical formulas, so if you “zoom in” on a fractal terrain, you can find ever finer details in the terrain. The last point is particularly interesting since it strongly corresponds to how terrain works in real life. For instance, a difficult problem is measuring the exact length of a land mass’ coastline. Putting aside the rise and fall of tides, coastlines demonstrate fractal-like complexity as you measure them in smaller and smaller units. Famed mathematician Benoît B. Mandelbrot wrote a fascinating paper on this very subject. Fortunately, SagaSim doesn’t need coastlines defined with molecular granularity, so I’m off the hook on that one! 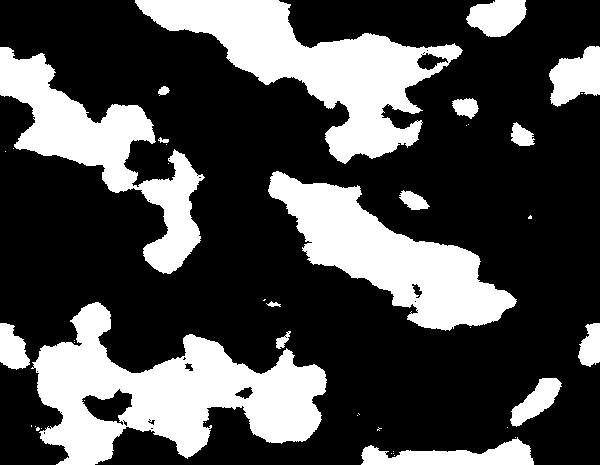 While there are many ways to generate fractal noise, a very common one is the perlin algorithm, named after Ken Perlin, who created the original algorithm for the movie Tron. 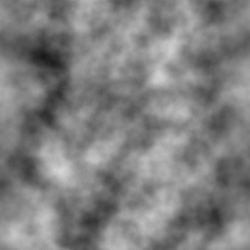 My algorithm is based on this version by Mr. Perlin. 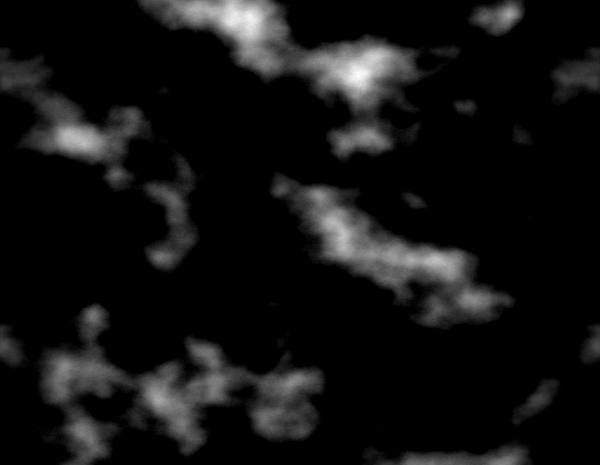 As an aside, in case you’re not familiar with methods for generating terrain, when presented as an image, lightness indicates elevation. 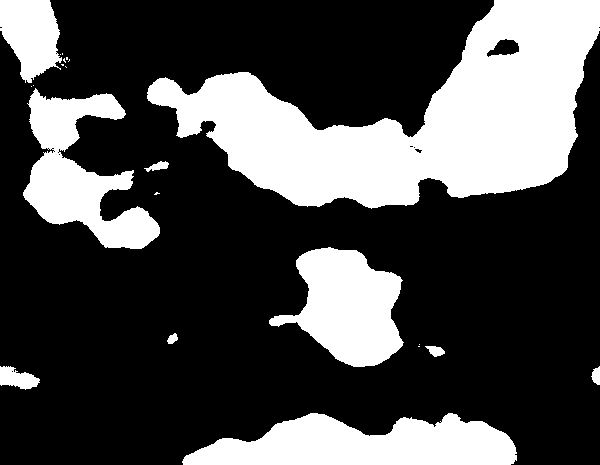 Black is the lowest elevation, while white is the highest. Without going into a lot of mathematical detail, there are a few basic inputs to a perlin algorithm: persistence, octaves, and lacunarity. Persistence indicates the “amplitude” or intensity of the noise. 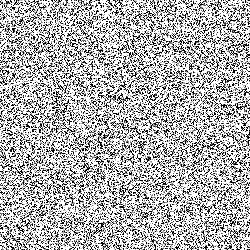 A high persistence means that the basic features of the noise will remain more “static” than they would if you used a lower persistence. Octaves indicate the “frequency” of the noise. Essentially, octaves work by adding the mathematical output of the noise function to itself–the same way that adding two identical sound frequencies together produces a tone that’s one octave higher. Finally, there is lacunarity, which can also be considered a “smoothness” value. This produces large-scale structures in the noise by layering zoomed-in versions of the noise on top of itself. If you didn’t understand any of that, you’re not alone. Let’s illustrate with pictures! Here is the base case: persistence of 1.0, 1 octave, 1 lacunarity. 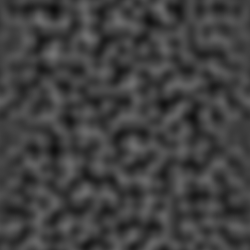 Basic noise: persistence of 1.0, 1 octave, 1 lacunarity. 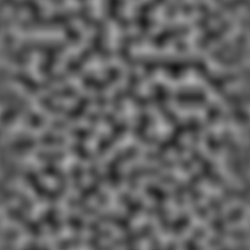 Noise with multiple octaves: 0.3 persistence, 4 octaves, 1 lacunarity. Noise with lacunarity: persistence 0.3, 4 octaves, lacunarity of 4. 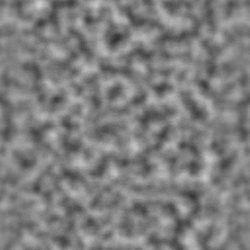 Noise with more lacunarity: persistence 0.3, 4 octaves, lacunarity of 8. You can see that now we have one prominent streak of higher elevations cutting from the right side down to the bottom left, and much lower elevations centered to the bottom right. Even higher lacunarity: 0.3 persistence, 4 octaves, lacunarity of 16. 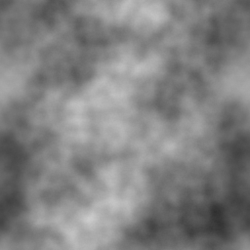 That didn’t turn out too badly, but you can likely see how there actually seems to be less variation in elevations–the lower elevations are crowded out by the higher ones, due to layering zoomed-in versions of the basic noise on top of itself so many times. In the actual SagaSim code, I find that using a lacunarity of 8 normally produces the best results. 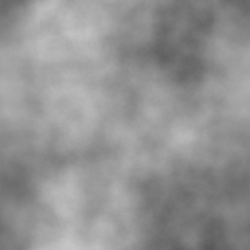 Noise mapped to a 3D sphere. By “seamless,” of course, I mean “the poles look like pinched crap.” No offense to any Poles in the audience. Welcome to the SagaSim development blog! I’m bad at introductions, so I’ll just get to the point. This is a blog about the development of SagaSim, which might best be described as a “world simulator.” It is currently under active development, and all the features aren’t even planned yet. I’m just working my way through it, one step at a time. Maybe it will be successful, maybe it won’t, but it’s already been quite a learning experience. 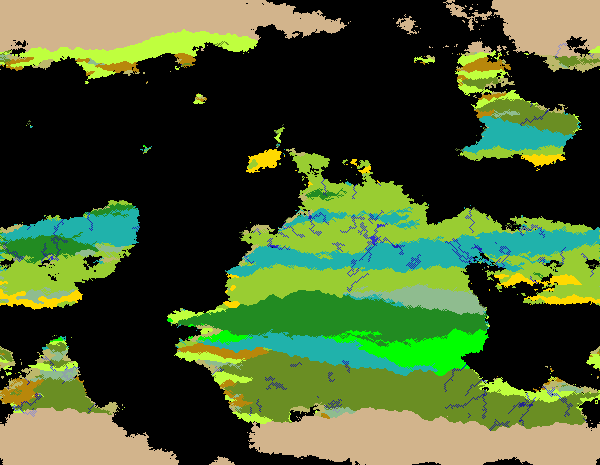 Procedural generation of world, including terrain, rivers, climate zones, and biomes. Dynamic generation of intelligent, civilized life forms. Simulation of resources, civilizations, important individuals, economies, politics, historical events, disasters, technological development, sociology, etc. Virtually all features can be controlled by the user. Given that description, it would be better to categorize SagaSim as a sandbox than as a game. There is no way to “win,” the point is to explore the options and watch your world develop and evolve. Everything is displayed using simple 2D graphics, though I don’t discount the possibility of a 3D view at some point. As of this posting, I have the world generation (mostly) done, and I’m about 1/3 of the way through defining the DNA system. Future posts will delve into detail about exactly how all of this works, so stick around! For those who are interested in the basic technical details of SagaSim, my platform is Python 2.6 with Pygame, psyco, and NumPy. It is only limited to Python 2.6 because of psyco, though if PyPy ends up fully supporting Pygame and NumPy I will probably transition to that. I’m still on the fence about what to do with the source code, and whether I should try to raise money to help fund development. I’ll certainly entertain suggestions, though. Feel free to post any questions, comments, or encouragement!